Next guest on my radio show: Blair Kitchen of THE POSSUM! 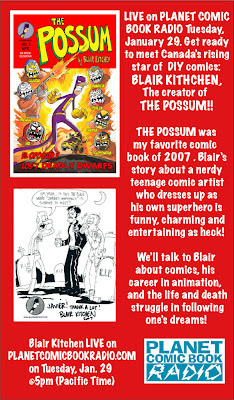 I've mentioned Blair and his most excellent comic book on a previous post here. But just to reiterate, this talented and driven cartoonist crafts one fantastic book. Talking to him about his career and art is something I'm very much looking forward to. So, as Blair is a Canadian artist, living in Toronto, I guess this puts the PLANET in PLANET COMIC BOOK RADIO! My first exposure to Canadian superheroes was probably Wolverine! 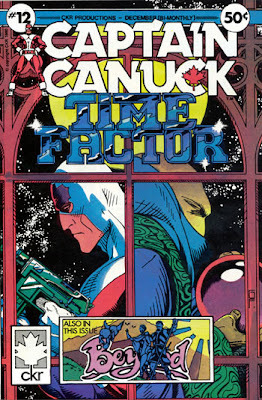 But I remember in the early 80s buying an issue or two of CAPTAIN CANUCK, a genuine Canadian comic book by Canadian creators. It'll be interesting talking to Blair about Canadian comics, and how his character fits into that particular field. And by the way, the Rafael Navarro podcast is now up on the PLANET COMIC BOOK RADIO website. That was a fun show to record (twice even!). Me and Raf have a long, mutual history in self-publishing, with our paths crossing many times. Give it a listen to! Rafael Navarro is BACK on my radio show today!!!!! 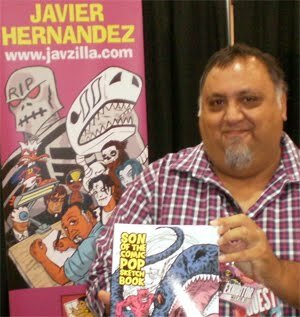 If you listened to my interview with Rafael Navarro on PLANET COMIC BOOK RADIO live on Tuesday, Jan. 8 you may have heard some technical snafus! Not only that, but only the first part of his interview was actually recorded! Sorry to Rafael and the listeners for that. Well, in the interest of journalistic integrity, Rafael was nice enough to come back to the studio on Thursday, Jan. 17 and record another interview. So our crack tech team has patched together both interviews for an hour long interview with Mr. Navarro. 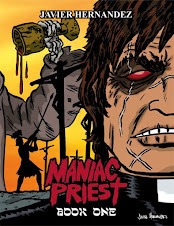 It will play today at 5pm on PLANET COMIC BOOK RADIO! 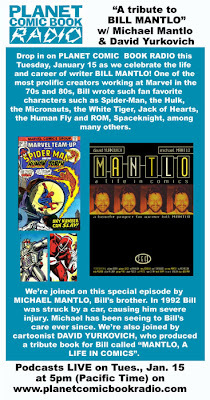 BILL MANTLO TRIBUTE podcast now available on the PCBR website! 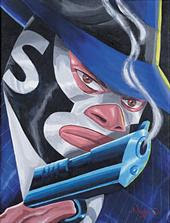 Tuesday's interviews are now archived here on the Planet Comic Book Radio website. A TRIBUTE TO BILL MANTLO features two interviews. One with Bill's brother Michael Mantlo who has been a caretaker to Bill since 1992. Bill was severely injured by a hit and run driver and has been in a nursing home ever since. While at Marvel Comics in the 70s-80s, Bill was probably the most prolific writer the company has had since the days of Stan Lee. Michael shared with us stories about growing up with Bill and how Bill's upbringing as a voracious reader led to such an amazing career in comics. In the second half hour I talked to David Yurkovich, a Xeric Award-winning cartoonist who wrote a wonderful tribute book for Bill called MANTLO:A LIFE IN COMICS. The book has raised over $20000 which David has donated to Bill Mantlo's care. The book features a career retrospective of Bill as well as three previously unpublished Mantlo stories. David talked about the creation of the book, and he and I also talked of our love for Bill's many works. As usual with the interviews, I felt really bad about the length of time for each guest. The show runs for an hour, so at the half hour mark I had to wrap up with Michael Mantlo. Same with David, after his half hour was up. But of course, you can never get everything you want in one interview. I always write myself some notes for each guest and use them as a guideline to direct the conversation. But in the end, each podcast should be a pretty informative hour of talk. And of course one of the purposes of the interviews is to drum up interest in the guests. So if anyone is upset with me that we didn't get to talk about your favorite Mantlo character (Jack of Hearts, the White Tiger, the Micronauts, Woodgod, Razorback, et al) I apologize! Like I've said, I was so proud to be able to even have the opportunity to create a Bill Mantlo tribute on my radio show. I am a very strong believer in giving back to the creators that were so much part of my growing up. And in Bill's case, with the terrible tragedy he underwent 16 years ago, even more so. With David's book, and the recent ROM, SPACEKNIGHT tribute art show in Portland, there is this wonderful sense of MantloMania being created by fans of Bill. So 'doing my part' was not only a chance for me to give back, but also a duty. Bill Mantlo Tribute on my radio show this week! One of the great things about hosting my own radio show? I'm really honored to be speaking to Bill's brother Mike on the show. Bill Mantlo is one of my top 5 favorite comics writer. A month ago I wrote about Billin a previous post, and how I first found his work. To think that when I read my first Bill Mantlo comic back in 1975 I would be able to host an episode of my own radio show for the man some 33 years later! All this really springs fom my decision 10 years ago to start publishing my own comics. Happy New Year to everyone! My best wishes for a great 2008! 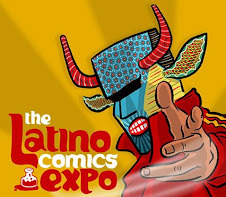 Tonite on my radio show I'll be talking to a great friend of mine, Rafael Navarro Creator of the cult comic book SONAMBULO, Raf has been a hard-hitting indie comics creator for the last 12 years. He's also got years of animation storyboarding credits to his name. And he's a heck of an entertaining guy to talk to! 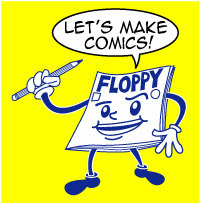 Join us tonite at 5pm (PST) at planetcomicbookradio.com! It's my first podcast of the new year and what better way to kick it off?! Due to unfortunate technical difficulties, Rafael's interview was partially cut off during the recording of the live podcast! Only 18 minutes remain. What a shame, as the interview went really good (I'm told by the folks who did indeed listen live during the 5 O'Clock hour). However, Rafael and I plan to sit down and record a 45 minute interview in the next week. So, we'll still be able to post a one-hour podcast with Rafael on the website. Hopefully that should be up by next weekend or so. I'll let ya folks know!